The Remote Viewer Fixed-Sight is a satellite camera system that is purpose-built for image-based environmental monitoring of remote locations. The Fixed-Sight system is ideal for permanent or semi-permanent multiple season, extended field monitoring. The system is ready right out-of-the-box, and all components are hardwired together for quick and simple installation in under 60 minutes. This unique system provides 12’ cables that allow you to mount the camera and two-way satellite transceiver up to 12’ away from the control panel. The control panel allows you to control the camera/satellite transceiver while on site—including triggering instant photographs. Start accessing photos of your remote site immediately. 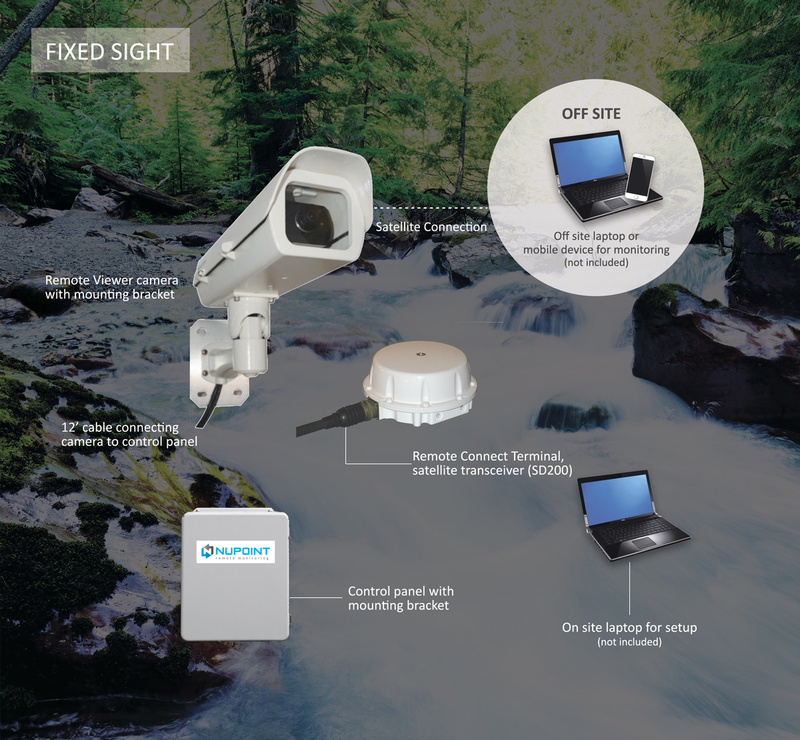 The Fixed Sight system can be configured on-site or from anywhere in the world as long as you have data connection. Customize your image taking frequency and have them sent to you and your team via email, or access and manage them from the Nupoint portal. The pre-connected 12’ hard-wired cables connecting the camera/satellite transceiver and the secure protective panel box allow the camera and satellite transceiver to be mounted in an elevated location, e.g., on top of a gauge station, with the control panel easily accessible inside or outside the gauge station hut.